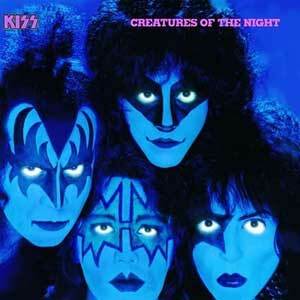 Creatures Of The Night is the 10th KISS studio album, the 18th domestic release (including compilations, solo and live albums), the last “makeup” album, the lead guitarist switcho-chango album, and the return to heavy rock… And the repudiation of all things disco, AOR, orchestral, pompous, danceable, light, colorful. 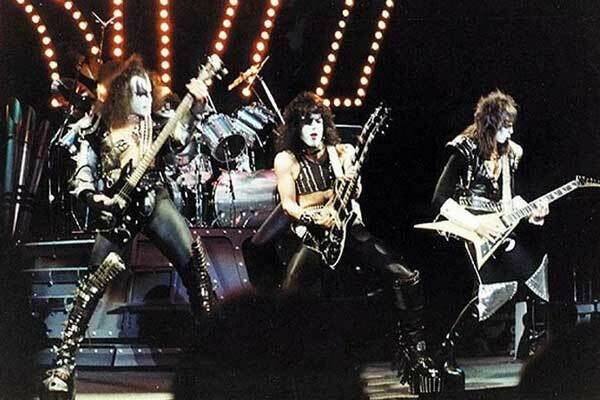 Following on the sword-and-sorcery heels of The Elder, KISS needed to break back into the genre they had ruled, that they had unwittingly locked themselves out of. Creatures succeeded. Not to the extent they had hoped – arenas were still half-full to mostly-empty – but it was better than cancelling tours and seeing bargain-bin remaindered records. 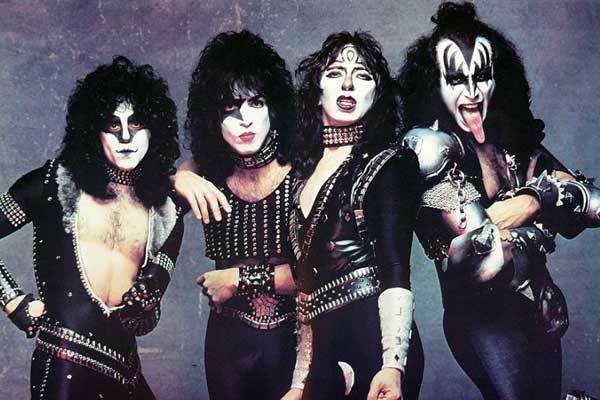 Musically – if nothing else – KISS were on the upswing. 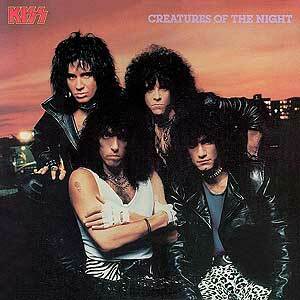 “Creatures Of The Night” re-release. New album cover – STILL wrong guitarist! But enough about politics. How was the album? Howling in the shadows too long, Creatures is definitely the bite back from KISS… Dark, driving, diabolical, the hands-down heaviest album in their catalog at that point in their career. Creatures Of The Night. Frenetic Eric Carr drum fanfare heralds the return of KISS (did I use that phrase AGAIN?) to the hard rock milieu. Paul Stanley, scratchy, biting vocals, is now sharing the same car oil Gene Simmons drinks. A high “Oooo” backing vocal recalls Sweet’s signature falsetto. I Love It Loud. Drums. Mountainous, monstrous, megalithic. Heavy as John Bonham beating to death a Death Star. Primal chanting. An anthem. And simply one of the most power-hammering KISS songs ever! The reborn God of Thunder growls in simpatico with us downtrodden teenagers, “Stand up / You don’t have to be afraid.” “No more treated like aliens / We’re not gonna take it!” “Loud! Wanna hear it loud / Right between the eyes!” This was around the time Gene kept quoting in interviews, “If it’s too loud – you’re too old” as if he coined it. Eric Carr – destroyer of worlds. Unbeatable! This is what he was hired for, this is what he was born for! As Paul Stanley mused (paraphrased), “I thought that to sound like Bonham you just needed the equipment and the production, but we did that to Peter and he still sounded weak, but with Eric, I realized that Bonham sounds like Bonham because he IS Bonham. You had to have that innate quality to begin with. Eric has that quality.” The drumming on Loud is magnificent for what it leaves OUT. In the fills, Carr doesn’t crap in every gap – he leaves snares and toms OUT for breathing space, to let that hall-of-the-mountain-king reverb breathe. War Machine. Gene Simmons closes the album with a riff forged in a metal foundry by a demi-god. “Wanna bite the hand that feeds me!”… “Set the demons free and watch ’em fly!” In the non-makeup years that follow this album – with the God Of Thunder hanging up his demon booties – this song would give Gene his excuse to continue to blow fire onstage. Vinnie Vincent plugs into hell’s amplifier and warps out a guitar solo that easily trounces anything that Frehley might have even thought about playing had he the inclination to leave his card games and beer. KISS 1982: Erect once more. 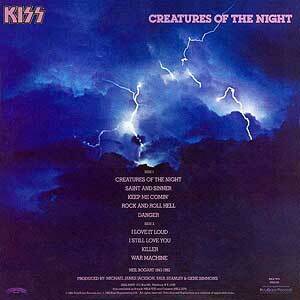 Interesting to note that Creatures is the first KISS album where Stanley and Simmons handle all lead vocals. Creatures, Loud and War Machine are easily the standout tracks, with Stanley’s sleazy Keep Me Comin’ a close fourth. Gene’s mid-tempo songs (Saint and Sinner, Rock And Roll Hell) are infused with a heaviness unheard on pre-1978 KISS albums. Stanley’s Danger and Simmons’s Killer seem like throwaways, or at least so derivative they don’t register as powerfully as the others. I’m not a fan of Stanley’s overlong heavy ballad, I Still Love You, which he apparently wrote for Donna Dixon (she was the superblond in BOSOM BUDDIES whom Hanks was “crazy about”). A cautionary tale for all us men: Dixon was engaged to Stanley, and during a tour, he kept calling her and finding her more and more distant. Finally, he discovered she had left him – for Dan Aykroyd! Yes, the superblond left the sexual panther rockstar for the gawky dork comedian. Fellas, if a woman can leave Paul Stanley – for DAN AYKROYD – what hope is there for the rest of us? And there was another co-songwriter listed on 3 songs, I Love It Loud, I Still Love You and Killer – V. Cusano. It was Vincent Cusano aka Vinnie Vincent, who would take on the persona of a new KISS character – the “Ankh Warrior” (aka Egyptian Ankh, aka The Wizard) – to join KISS onstage for the Creatures tour. History has again been rewritten when it comes to “Cusano”; you will rarely see that name anywhere in KISS media or archives – unless you own the original vinyl pressing of Creatures Of The Night! Damning evidence, Mr. Cusano! Show us the Birth Certificate! Of the three singles, only I Love It Loud has a video. Filmed on a stage fashioned like a tank, with massive treads on either side, and Carr’s drumkit sitting atop the turret (which was able to move back and forth and forward, and even simulated firing shells! ), we see the rejuvenated Heavy KISS: Gene bastardizing his Destroyer costume and once again wielding his axe-bass (oh yes, my son! ), Paul reverting to Love Gun era, Eric stepping out in the new KISS fall collection, while Ace is inexplicably in his Elder garb! Inexplicable if you weren’t aware of the background politics: Ace was definitely out of the band by that point and only appearing in the video for contractual reasons (and to provide continuity for fans). So I presume the KISS organization didn’t want to shell out $30,000 for a new Spaceman costume that was never getting off the ground. RETROSPECT NUGGET: Paul was pushing for the makeup to come off on this album (rather than where it eventually came off – on the next, Lick It Up). The unmasking might have been more compelling, because Frehley might have been the one to unmask, rather than Vinnie. I say “might” because who knows what that strange contractual situation entailed? Would Ace have unmasked only to announce he was out of the band anyway? Ah, KISS-tory is a confused harlot. Like real life fans. Released: Sep 1982, Mercury Records. Adam Mitchell, Mikel Japp, Bryan Adams, Jim Vallance. by Jon Dunmore © 11 Nov 2015.